Do you know that you need to work harder at marketing your freelance writing services, but maybe you're not sure where to start? 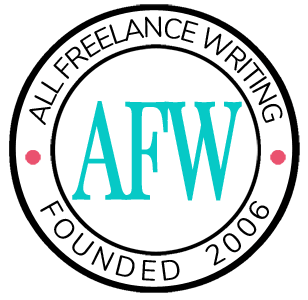 Well, we're all about the business and marketing side of freelance writing here at AFW, and moving forward I'll be offering Monday marketing tips to bring you new ideas each week for promoting your services. Write a blog post -- Every time you write a post for your blog, you're potentially putting your name in front of every one of your subscribers (some of whom may be prospective clients, and some of whom may be colleagues who could refer work to you). Submit a guest post -- Writing a post for another blog has a similar benefit, even if it's not a "top" blog in your niche. You'll have an opportunity to get your name in front of someone else's subscriber list (with similar benefits to writing for your own blog). Comment on blogs in your niche -- Whenever allowed by the blogger, include a link to your website in blog comments. Just remember to make comments that add to the conversation rather than ones that amount to little more than spam. Update your professional site -- You might not even think of this as marketing, but it is! If your sales copy on your site isn't converting well enough, update it. It's time to try something new. A key to effective copywriting is testing. Never forget that. Email past clients -- Did a client hire you for a big seasonal project recently? If so, they might be interested in something similar now. Think about the season, upcoming holidays, etc., and see if there are any ideas you could pitch to previous clients to bring in more work. Update your email signature -- I'll admit it. I don't always use my email signature to my best advantage. But it's such an easy fix. While you're emailing clients anyway, go ahead and make sure your signature includes a link to your professional site and / or blog (and don't forget a call to action!). Update your portfolio -- Do your portfolio pieces really reflect the type of work you're interested in taking on? If your focus has changed (or if your portfolio pieces are just out of date) consider updating them. They could make a difference between a sale and a lost opportunity. Join a new forum or social network -- Sure, it's best if you're already well established in an online community when it comes to meeting new clients. But if you're new to it or you've tapped your market elsewhere, find a new niche community and give it a shot. Offer a sale -- If you need a sudden boost in client work, a sale can be a great way to pull in new clients. For example, you might offer 20% off of a client's first order. The key is in making sure they like your work enough to come back again (at your regular rates). Offer referral incentives -- If you have a large previous client base, but no one seems to need you for projects at the moment, ask them for referrals. Your clients are probably well-connected with like-minded business owners. You could offer them a future discount, free report, or something else as an incentive to send referrals your way. Offer yourself as an authority source -- You chose your specialty for a reason. Chances are good that you're an authority at something. So tell people about it! Use media directories and expert exchange sites to offer yourself up as an interviewee within your specialty niche or industry. Getting interviewed elsewhere helps you build visibility. And don't limit yourself only to major media sources. While a lot of people don't realize it, there's quite a bit of value in being featured on smaller sites, blogs, newsletters, or other publications in your niche. Not only will you be exposed to a highly targeted audience, but those publishers often go more out of the way to promote their content and their guests than larger publications do (where they're moving onto the next thing far more quickly). Give something away for free -- I've said it before and I'll probably say it again: giving something away is one of the best marketing tactics for service providers. It doesn't have to be much. Just a simple 5-page report can do wonders. Educate prospective clients about something which shows that they need services like yours, then end it with a call to action to get them to contact you (and hopefully hire you). Advertise -- If you have the budget for it, go ahead and advertise. That could mean buying banner space on sites your clients frequent, buying a decent ad in the Yellow Pages, running a pay-per-click (PPC) ad campaign, or any other type of advertising relevant to your specialty area and target market. Use Q&A sites -- Visit sites like Yahoo! Answers to search for and respond to questions in your niche. Leave a link to your professional site or blog when appropriate. Launch a contest -- People love contests, because they love having the opportunity to win something. Come up with a prize idea and figure out how you can use that prize to promote yourself -- get more blog comments, get more referrals, etc. Send a query letter -- While I'm personally a supporter of the query-free freelancing approach, that doesn't mean it's for everyone. If you prefer querying, then go ahead and do it! Write a query letter (or two, or three) today and pitch ideas to potential clients. Send a pitch letter -- Similar to a query letter, but more in line with offering yourself up as an authority source, send a pitch letter today. Come up with a story idea for a blogger or journalist in your industry or niche and pitch it to them. In this case you're not offering to write the article, but offering to serve as a source. It can increase your chances of coverage when you offer ideas you'd be a particularly good fit for. Update your branding -- It's possible that your branding could use a fresh approach. Think about your business name (if you use one) or your website URL. Do they really work for you? How about your slogan? Your logo? Your business cards? If anything feels dated, update it (or think about hiring a designer if you have the budget and you want a more professional look than what you might be able to put together on your own). Write (or update) your marketing plan -- There's no good excuse for you not to have a marketing plan laid out for your freelance writing services. It's your roadmap. It's how you determine which marketing tactics are right for you before you waste time on them. Just do it. Create one. And if you have one but it's been sitting around for a year, then go ahead and dust 'er off and update it. Chances are good that your situation now (or what you should be doing to change that situation for the better) is different now than it was then. Most of these marketing tactics can be done in a single day. By all means you shouldn't try to tackle all of them at once, but pick and choose. Figure out which tactics will work best for you and your market, and start putting them to use (or if you already are, consider changing your game plan a bit). A little bit of responsible marketing really does go a long way. Don't let it go neglected. Of course, you have to remember to DO these things, and not fall into the trap of reading about them. As for me, today I’m focusing my marketing guns on free video content to develop my brand further. That’s what to-do lists are for. They’re my best friend in all things business. These are good suggestions. I don’t have a marketing plan, so I’m definitely going to look into that. Thank you. Even better…do at least of these things everyday. I have list like this (that wasn’t this long until today) and I try to do something off the list everyday. That way, you’re always marketing yourself. Well, I have to disagree there. I think the best marketing actions are the ones with the highest return of investment. That’s why I’m focusing on guest posts and video content – people get the most out of them. It depends on your niche, though. In general, yes. And your ROI should be factored into your overall marketing plan. But the reality is that most writers won’t do larger-scale marketing work every single day… but there’s no excuse why they can’t at least make time to do something small. And that’s the point I’m making — not that you should ONLY do these little things, but that when you can’t do a lot, it’s always better to still do something. The thing is, you don’t know which efforts will and won’t produce return–or when. So I spend the bulk of my time on proven methods, but I never leave out the little things. You wouldn’t believe the work I’ve gotten from crap I never even expected to result in anything. You can not assume anything. That’s true. A lot of this is testing to see what works. That’s what I need to see for my own marketing efforts – if they’ll really get me the results I want, when applied for the right period of time. Testing is incredibly important. Just remember, before you jump into testing a significant part of your marketing plan should have been devoted to market research. When done properly, that research will give you a better idea of what types of marketing tactics will work for you and which ones probably won’t. So solid market research first to narrow down the best options for you, and then testing to really hone those marketing efforts.